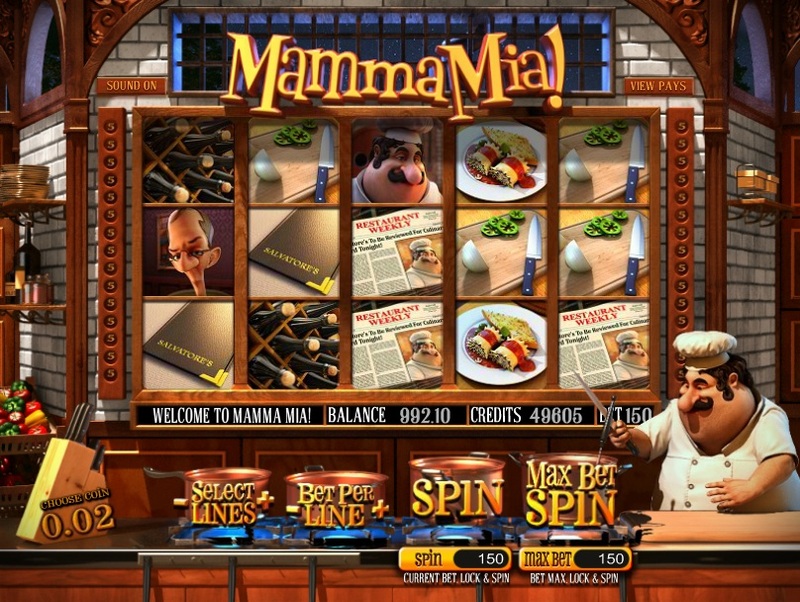 There are only a few slots that have a hidden surprise, and the Betsoft Gaming slot Mamma Mia is one of them. If you can bear the suspense I will tell you what it is later on. 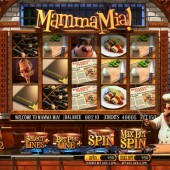 This 5-reel, 30-payline slot is based around a portly Italian chef who gets a visit from a snooty-looking food critic. Our master cook has to overcome his nerves to prepare the critic a fantastic meal. During the game, the chef in the bottom right hand corner is busily preparing his stock, chopping food and crying out several well-known expressions that only Italians would say. The game has no less than three bonus rounds and a special feature (that I mentioned at the beginning) that allows you to lock Wilds in position. During any spin in normal play you can choose any Wild that appears on the reels and lock it in position for the next spin. Your wager is increased for doing this, but sometimes it can be worth it. When you select the Wild you also then need to click the yellow spin button under the normal spin icon to lock. I wasn't brave enough to do multiple bets with locked Wilds, as they continue to multiply each time. However, I tried this in free play and my opinion is that holding multiple Wilds can work, but it is a risky strategy. My advice is to try it out carefully and make your own conclusions, as I don't think there is a way of predicting a big win. There is a free spins bonus that is triggered by seeing three or more pizza symbols on the reels. You will then get a different set of symbols that are all ingredients for the chef's pizza. It can reward you well on occasion, but I am not convinced it is that great. The other bonuses involve a pick 'em type wins, one of which involves the critic. He gives your meal a rating out of 4, with the biggest reward for a higher mark. I really like Mamma Mia, as you can find lots of little things in this game that are not obvious when you first start playing. If you like Betsoft games then you should also check out the magical world of True Illusions and the tribal-themed slot Aztec Treasures. Both have plenty of bonus rounds and are worth trying out at least once.